Mackenzie Foy is The Little Girl in The Little Prince, an Entertainment One release. Canadian animated features are few and far between. There’s an impressive catalogue of shorts and stuff coming out of the NFB and pockets of independent innovators, but the costly venture of feature-length animation leaves a sparse field in the Canuck canon with notable exceptions like Asphalt Watches and The Legend of Sarila. Sometimes, Can-Con collaborations yield remarkable gems like the 2003 Oscar-nominated co-pro and Canadian Genie winner The Triplets of Belleville. Going big requires a pooling of resources, especially for a project that requires so much detail and dedication, and the flight of fancy The Little Prince is another step forward. Cut to twelve years after The Triplets of Belleville and Canadian film has its biggest and most ambitious animated endeavour with the Canada/France co-venture The Little Price. The film adapts the beloved children’s story by Antoinede Saint-Exupéry and The Little Prince bears the timelessness of its source material with an inventive hybrid form that mixes classically composed animation with cutting edge computer-generated work available in 2D and 3D. (This review considers the 2D release.) The Little Prince might not be the overall masterful work of art that its source material is—or, by comparison, The Triplets of Belleville is—but it’s nevertheless an exquisitely rendered odyssey of childlike wonder. From the perspectives of the artistic and technical merits of animation, it’s a significant achievement. The childhood classic endures in this impressive adaptation, particularly the scenes that directly re-imagine the original work. The film uses its mixed form with a present-day narrative frame in which a nameless mother and daughter, voiced by Rachel McAdams and Mackenzie Foy in the English-language North American release, struggle with many of the same anxieties that the Little Prince encounters in the storybook classic. The mom pressures her daughter to be the right material for the aptly named private school Werth Academy, so the girl’s summer becomes a tightly organised regime of studying and training. Every kid needs the lessons afforded by a good friend, though, and the girl befriends their elderly neighbour (voiced by Jeff Bridges), an eccentric aviator with a fantastic story to tell. The tale, which he shares with the girl almost immediately, is the adventure of the Little Prince. The Little Prince (Riley Osborne) and The Fox (James Franco), in The Little Prince, an Entertainment One release. The Little Prince offers an adaptation of Antoine de Saint-Exupéry’s classic adventure as a story-within-a-story. Director Mark Osborne brings the book to life unlike anyone has on film before with gorgeous stop motion sequences that celebrate the power of the imagination. These sequences might not be as crisply detailed as the computer-generated storyline is, but there’s a true art to their form, something warm and tactile that many contemporary animated films lack. The stop motion sequences are more accessible and inviting through their vivid colours, enchanting atmosphere, and nostalgic aesthetics evoke the magical charm of storytelling that endears The Little Prince to readers young and old. These sequences, which appear too rarely in the film, are genuine works of art and playful reflections on themes of individuality, love, and creative freedom evoked somewhat more clumsily in the present-day frame. 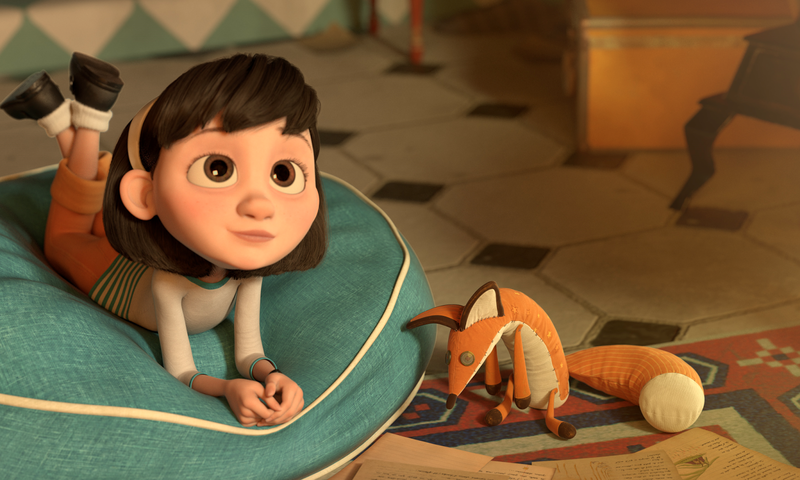 The storyline with the girl ultimately overwhelms the film, though, about two-thirds of the way through when The Little Prince evolves into full-on fantasy and the girl goes in search of her prince. The animation remains a marvel and compensates for the sheer randomness of this sharp turn in style and tone by offering a funny sidekick in the girl’s friend the fox. One longs for a return to the Little Prince’s planet and it never comes, even though The Little Prince breaks from reality with out-of-this-world adventures. The latter-act digression introduces a cast of new characters and The Little Prince assembles an impressive range of star power for both threads of the film. Paul Rudd and Riley Osborne voice the Little Prince in the present and fantastical storylines, respectively, with James Franco taking the role of a wily fox in the storybook scenes, although the fox’s silent scene-stealing counterpart in the computer-animated narrative gives the better performance and is bound to become a new favourite for kids. Marion Cotillard gives a brief, but memorable, reading as a seductive rose and The Little Prince features a chorus of baddies voiced by Paul Giamatti, Benicio Del Toro, Albert Brooks, and Ricky Gervais to name a few. McAdams and Bridges, finally, are well-cast as the frigid mommy and endearingly kooky aviator, respectively. The aviator, modeled on the storybook author himself, appears within both tales and straddles the two worlds of The Little Prince as he recounts the story to his young friend and draws upon his own experience. The aviator, like the little girl, tells of a young mind searching for a creative outlet to escape from the crowd. The joyful relationship between the aviator and the girl evokes that of a parent and a child passing the story from one generation to the next, so The Little Prince both honours and furthers the legacy of its source material even if the frame of the adaptation isn’t up to snuff with the scenes that animate the storybook itself. The Little Prince is now playing in limited release.